A Step By Step Strategeis Guide On How To Excel At Day Trading Trading Has Finally Arrived!Strategies on How to Excel at Day TradingDay trading is an incredibly competitive field, but there is undoubtedly money to be made there if you know what you are doing. Unfortunately, even if you are familiar with what works in the stock market, you may not be prepared for the unique life of the day trader which is why it is helpful to have as many proven strategies up your sleeve as possible. If you have already dipped your toe into the waters of day trading and are looking to take your skills to the next level then Day Trading: Strategies on How to Excel at Day Trading is the book you have been waiting for.Inside you will find a detailed breakdown of many of the most common patterns that are the secret to success for a wide range of day trading strategies whether you want to focus on the 1-minute chart, the 5-minute chart or even the 4-hour or daily charts. While many day traders focus on making as many trades as possible, the truth is that quality is just as important as quality, if not more, so and Day Trading: Strategies on How to Excel at Day Trading can show you how to only find the best trades while blocking out the rest of the market’s noise.Inside you will find:	14 different patterns that will help you determine the current momentum of the market no matter what the specifics. The 6 different types of gaps and how to make the most out of each of them before the fills set in. 8 different patterns and strategies for trading reversals to ensure you are always prepared to make the most from market movement. Everything you ever wanted to know about rising and falling wedges as well as the mysterious sideways wedge. And more…This is the only strategies guide on day trading you will ever need! Day trading is an incredibly competitive field, but there is undoubtedly money to be made there if you know what you are doing. Unfortunately, even if you are familiar with what works in the stock market, you may not be prepared for the unique life of the day trader which is why it is helpful to have as many proven strategies up your sleeve as possible. 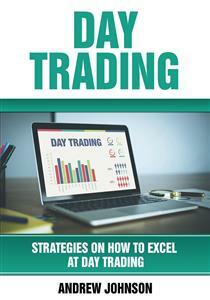 If you have already dipped your toe into the waters of day trading and are looking to take your skills to the next level then Day Trading: Strategies on How to Excel at Day Trading is the book you have been waiting for. Inside you will find a detailed breakdown of many of the most common patterns that are the secret to success for a wide range of day trading strategies whether you want to focus on the 1-minute chart, the 5-minute chart or even the 4-hour or daily charts. While many day traders focus on making as many trades as possible, the truth is that quality is just as important as quality, if not more, so and Day Trading: Strategies on How to Excel at Day Trading can show you how to only find the best trades while blocking out the rest of the market’s noise. While day trading is often placed on a pedestal by those who haven’t yet mastered its ins and outs, the truth of the matter is that it is just like any other type of trading at its heart. If you can learn the strategies, and you have the mental fortitude to act only when your indicators tell you it’s time and always get while the getting is good, then you can be a successful day trader. All you need is the strategies in this book to help you on your way. So, what are you waiting for? Get ready to take control of your financial future and live the life you’ve always wanted! Get started now and buy this book today! 14 different patterns that will help you determine the current momentum of the market no matter what the specifics. The 6 different types of gaps and how to make the most out of each of them before the fills set in. 8 different patterns and strategies for trading reversals to ensure you are always prepared to make the most from market movement. Everything you ever wanted to know about rising and falling wedges as well as the mysterious sideways wedge. Congratulations on downloading Day Trading: Strategies on How to Excel at Day Trading and thank you for doing so. Day trading is an incredibly competitive field, but there is undoubtedly money to be made there if you know what you are doing. Unfortunately, even if you are familiar with what works in the stock market, you may not be prepared for the unique life of the day trader which is why it is helpful to have as many proven strategies up your sleeve as possible. As such, the following chapters will discuss many of the most widely used day trading strategies to ensure you are on a level playing field when you head out to meet the competition. First you will learn about the benefits of momentum trading including the anatomy of momentum stocks, the right entry points and the right screeners to use to find them as well as the filters to use to make them worth your time. You will also learn several relevant chart patterns and multiple different strategies to take advantage of them as completely as possible. Next you will learn all about strategies for trading the gap including all the different types of gaps, what it takes to fill them and strategies to profit from them before they are lost completely. You will learn strategies for trading full gaps, partial gaps and everything in between. Then you will learn all about reversals and how to put them to use for you. You will learn how to expertly identify a reversal and how to take what you have found and profit from it via a variety of different patterns and strategies. Finally, you will learn all about wedge patterns and how to put them to work for you. You will learn about rising, falling and sideways wedges, what each means and the strategy that will work best in each situation. When you are finished you won’t be able to look at a chart without seeing something that you can make a profit from.